Due to the outcome of this question (Is there any way to Terraform Ceres?) I am now working on the concept of shell worlds. My question is the docking itself. Is there anyway to dock a ship safely and with minimal jolting and then be able to drag said shop into a station preferably using that same system? Notes: Hegemony engineers want a system that is able to accommodate virtually any ship via interchangeable parts. Also Ceres does spin slowly to simulate gravity. How fast "slowly" is I have no idea. 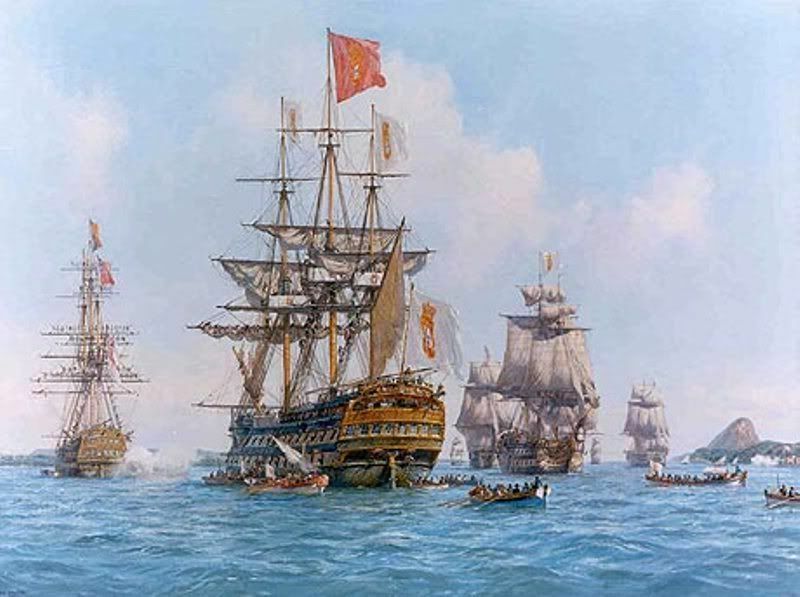 The question of safely accommodating a big delicate ship in port came up during the age of sail. These large ships were not very maneuverable in close quarters, and did not want to risk damage coming close to a port. Nor did the port want to risk damage by the ship. Instead, small boats went back and forth between ship and shore. One of the main roles of a ship's boat was to act as a taxi to move stores and people between shore and ship, and between ships. Although some boats were general purpose in nature, boats such as the Captain's gig and the Admiral's barge were for the exclusive use of officers. It was also the role of a military vessel's boats to act as landing craft, to deliver boarders and cutting-out (night attack) parties. When a ship was becalmed, mastless, run aground or otherwise unable to move, a ship's boat provided a source of motive power. The ship's anchor and cable would be rowed a distance from the ship before being laid, the crew would then man the ship's capstans to haul the ship forward, known as kedging or warping, this would be repeated as many times as needed. The ship's boats could also when needed be used as a lifeboats and rescue boats. Your varying spacecraft could be fitted out with more standardized and maneuverable all-purpose boats. I like the idea of these space boats filling more than one role over the course of a story as was true for the ships boats described above. I also like the idea that even in space, they are still called boats. The standard solution - adopted on the ISS - seems to be a robotic arm with some sort of berthing interface on it. If the Hegemony only allows ships with 'Grappling fixture H-8' to dock, surely most of the vessels would be equipped with the standard interface. Docking to a spun-up dwarf planet is harder, but I think it is managable. As explained in this article (discussing Ceres from the Expanse), on a spun up asteroid surface velocity is greater than escape velocity (if you drop something, it wont fall back down or orbit the body, but end up on solar orbit), so the reverse process is also possible: You approach on a carefully tuned hyperbolic course almost touching the surface, and on the periapse, while being relative rest to the structure directly underneath you, the ship can be safely grappled. To me, the best solution would be to not use a hangar at all. After all, current hangars are typically used by aircraft and cars to protect them from bad weather. Space ships simply wouldn't need any protection, as they are in the same environment they are always in. It's like putting a roof over a harbor to keep the boats safe from rain; it's just not needed. Instead, having the ships "park" outside the station (while matching the station's rotation) would be a lot easier to manage. However, I agree with you that trying to dock a skyscraper-sized spaceship in the same way we dock ships with the International Space Station would cause problems, such as accidentally bumping the space station or "double parking" when the huge ship blocks multiple airlocks. 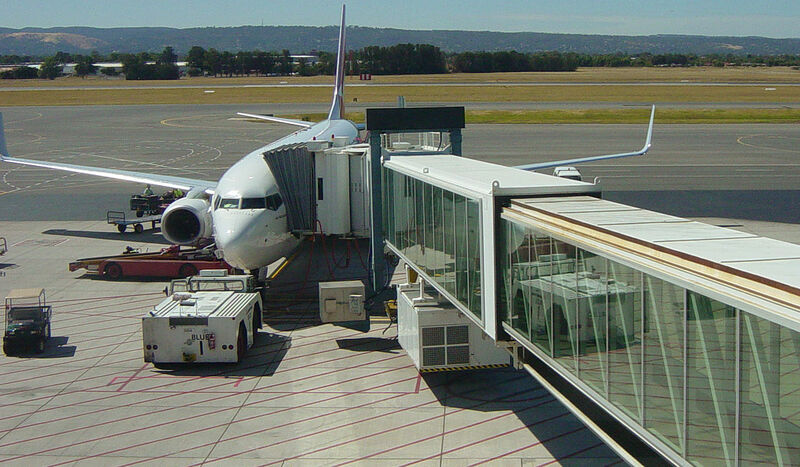 A Jet Bridge could be extended from a station towards ships to latch onto their airlocks while keeping the ships a manageable and safe distance away. Maybe having multiple bridges per ship would be ideal, so passengers and cargo could be unloaded simultaneously. The interior of these space bridges could either be long, null-gravity hallways for passengers or the equivalent of a conveyor belt to help unload cargo speedily. Of course, space Jet Bridges (space bridges?) would have to be much longer and more flexible then the ones we use. When I mentioned this device in my story, I straight up compared them to an octopus' tentacles. This is less answering your question and more providing an alternative, but I think it might be useful to you. I would have ships put into a parking orbit. Space ships are probably more delicate than the wooden ships of the age of sail. They are also capable of more damage to a station than the wooden ships. I'm only thinking about large ships here. 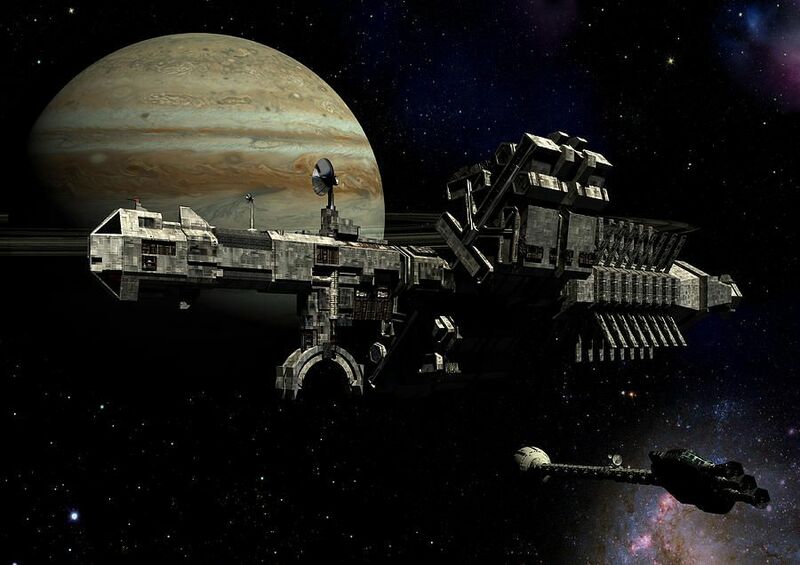 Think of an engine powerful enough to move a huge space ship. Let's go space opera and think about a roughly spherical ship 1 mile in diameter. 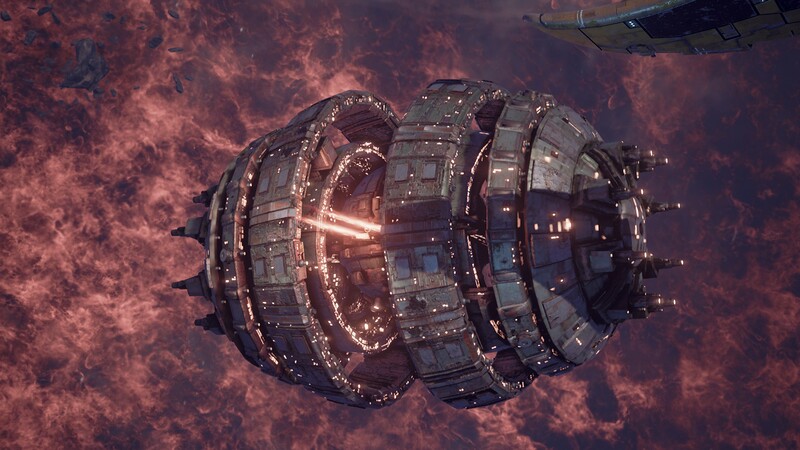 Even if you discount any weapons on the ship, the force from it's engine would probably destroy quite a bit of the station if it were set off on purpose or by accident. The think of any weapons that on on the ships. Even if these weapons are illegal, somebody will have armed their ship. An energy weapon powerful enough to hurt another ship at ranges measured in hundreds of kilometers would probably cut through the station like butter. In the real world terrorists have used stolen vehicles as bombs and missiles against property and people. I'd have my stations armed against any boat (a landing craft) trying to get close without permission, and if a ship tried it, the station rules would have it be destroyed if it got past a set limit. Perhaps the limit would depend on the size and velocity of the ship (larger and more dangerous ships might be required to park further away). Large ships might be very difficult to dock anyway. Another problem might be even worse. Are their alien ships in your story? It might be difficult to explain the engineering specs of the appropriate landing gear to an alien. Then there is either pilot or computer error. A very small group of errors could cause a simple docking to turn into a crash. If you've spun it up to produce internal gravity, then there will be a null-g area along the axis of rotation. Put a door at either or both poles. Sufficiently fast spin will keep the atmosphere glued to the walls and you can have an airlock if necessary to keep lossage to an absolute minimum. Then the docking ship just matches its own spin to the asteroid's spin, flies in, and lands gently on the elevator pad at very low g. Once everything is settled the elevator can descend, taking the ship down to the high-g, high pressure area for convenient loading, unloading, or maintenance. For larger ships that can't land, put a spin decoupler at one pole so they have a stationary dock and have a tram system that moves from the stationary section to the rotating section and back via simple braking. You'll need station-keeping engines of some kind to keep the relative velocities within bounds, but you'll need those to keep your station pointed the way you want it to anyway. I would prefer good ol' landing. Ceres is small enough to have a 0.029g at its equator, which means that you can safely land and take off with a minimum consumption of fuel, and with few risks. Since you had thought of terraforming it, why not instead start digging for installations under the surface? This would allow extensive mining and a safe harbor for the crafts. A typical space probe in todays era launches and begins its journey, gaining speed at various gravitational slingshot points, it's path being meticulously worked out in advance. The voyage often takes months, or even years. During this period the speed of your ship is really fast, like 17km/s fast or so - otherwise your ship would take forever to get to its destination. On arrival, normally if there is an atmosphere you can use atmospheric breaking to slow your ship down. If there is no atmosphere to speak of, you need to slow down using engines. Sounds like your ships are really big - and heavy. It stands to reason you need to carry inordinate amounts of fuel to slow it down from such super-velocities. However in the 1960's Apollo missions they came upon a solution. A direct ascend and descend craft on the moon is simply not feasible because of the problem above, however it was discovered a possible solution to this problem is to remain in orbit, as a 'parent' craft, and then only send down what you need in light-weight landing craft. This saves weight, and saves fuel and makes the journey possible. 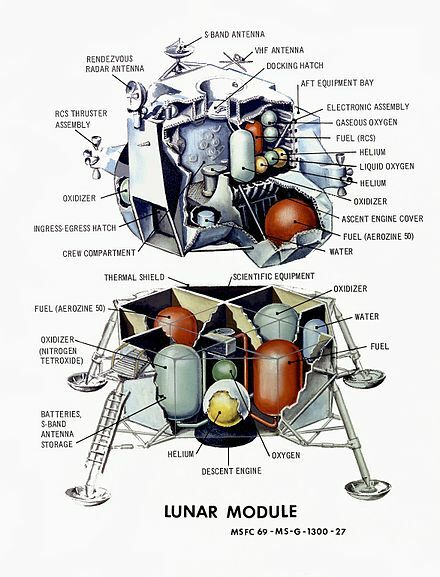 The Lunar module was developed specifically for this purpose. Every aspect of it was about saving weight to lower the amount of fuel for deceleration - even the number of legs were discussed as being 3 instead of 4 (they settled begrudgingly on 4 in case one failed). A similar landing craft with landing pads on your planet would be the most logical - with parent craft (like the Apollo Command Module) remaining far out in orbit. My reaction is that for ships of any significant mass or size, letting them inside your station or hard-coupling them to it requires a world populated entirely by sane, competent, well-rested, trustworthy, benign humans flying around in enormously complex, powerful and nearly infallible machines. Does not sound like this universe. The answer that mentioned big sailing ships and saltwater ports seems very much on-target. If it was my station, I'd insist that any ship bigger than a vac-suit approach VERY slowly and carefully on a nearly-tangential path (maybe even under station control?) and then I'd allow it to be grappled by a long, modular, powered hollow arm that doubles as a jetway and service corridor. Each arm has autonomous onboard power and AI. Only when the arm trusts you will it grapple your ship, and if it ever changes its mind and suspects you or your ship are a danger to STATION it will toss you away like a bad apple. If a ship is staying longer than it takes to unload & load, the arm could transfer it to a simpler 'parking' stand - while still keeping a close sensor suite on it. Seems like there would be all kinds of stresses and angular momentum issues - you might have to mount the arms on reinforced world-girdling ribs for example, or pump megaliters of water (which you'd want to have anyway) around inside your station to keep things nicely balanced. I figure if my washing machine can do that, so can Ceres. Not the answer you're looking for? Browse other questions tagged science-based reality-check science or ask your own question. Is there any way to Terraform Ceres? What can you disguise a space ship as? That's no moon! It's a space station! How big can a space ship be before it collapses on itself? Death Star-esque space ship in Earth's orbit - how to destroy it without destroying earth? How does space between ends of a wormhole work? How small of a planet can sustain life as a desert planet? How can I turn diamond into graphene?